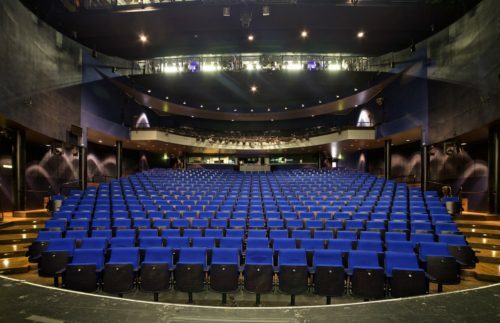 The Schauspiel Hannover, part of the Niedersächsische Staatstheater Hannover GmbH, offers the audience theater, entertainment and music in five different venues. In addition to the Schauspielhaus on Prinzenstraße near the main station, these are the Cumberlandsche Bühne, the Cumberlandsche Galerie as well as Ballhof Eins and Ballhof Zwei in the old town. After the sound mixing desk had been renewed in the Schauspielhaus two years ago, the next logical step was the modernization of the main and back-stage sound system. 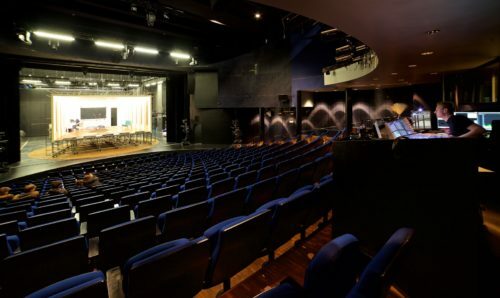 As usual in the theater, it was also important to integrate the new portal sound system as inconspicuously as possible in the building, so that stage designers are minimally restricted in their design freedom. The set-up times for the employees should also be kept as short as possible. After comparing different line array systems of various manufacturers, the Alcons solution was selected. Ultimately, the company chose a main PA system consisting of 24 Alcons LR14 compact pro-ribbon line-array systems (10x 90° and 2x 120° per side), supplemented by a center PA system consisting of 6x Alcons LR7 micro pro-ribbon line-array systems and 2x Alcons BF151 and BF362 subwoofers as low-frequency extensions. For backstage per side each 2x Alcons RR12 pro-ribbon point-source arrays and a BF362 subwoofer are used. All systems are powered by a total of six Sentinel10 4-channel amplified loudspeaker controllers. For mobile use, there are a further 4x Alcons VR12 monitor, 4x Alcons VR5 mini-monitor, 2x Alcons BF362 subwoofers, two Sentinel3 and one Sentinel10 amplified loudspeaker controllers available.